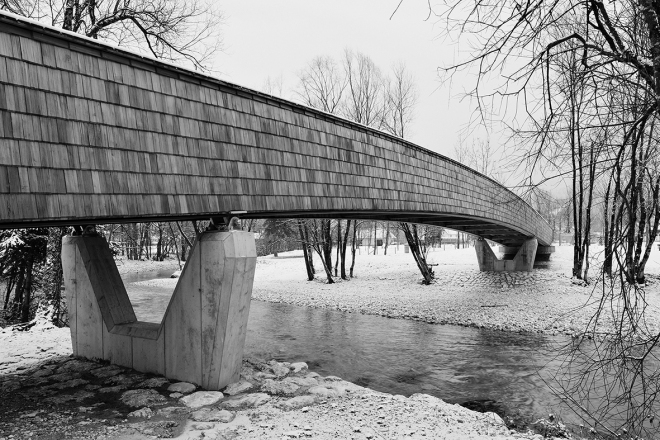 We kindly invite you to the opening of the exhibition Slovene Alpine Architecture 2008-2018, on Monday, 28th January 2019 at 8 pm. 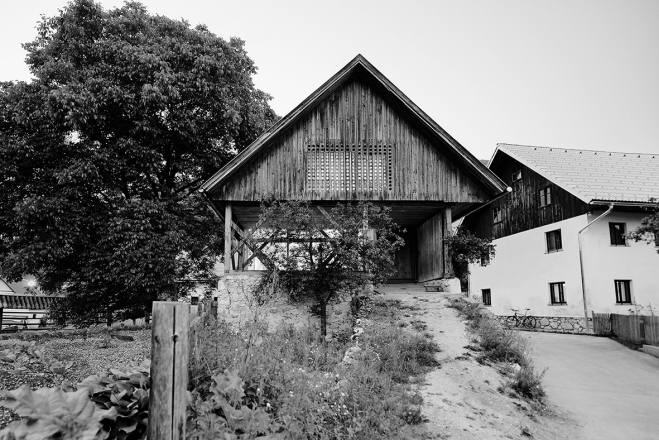 Architecture that endures in a space through decades actively affects the cultural identity of a landscape. It doesn't shape only the space but chiefly the mentality and consciousness of the people. 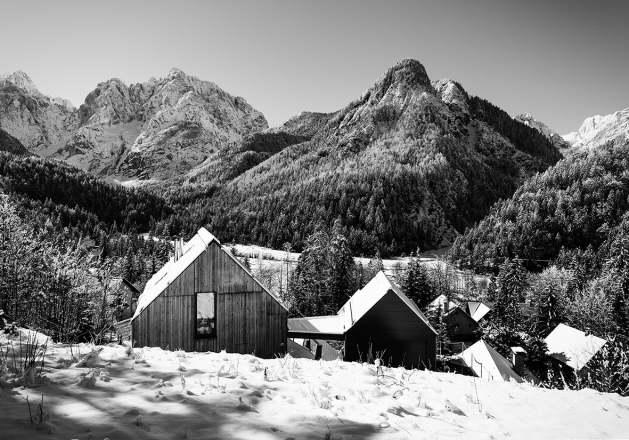 The Slovene Alpine landscape is one of those fragile environments which are – due to their precious wild nature, extreme weather and topographical conditions, built heritage, and distinct tradition – particularly sensitive to various interventions, especially architectural ones. 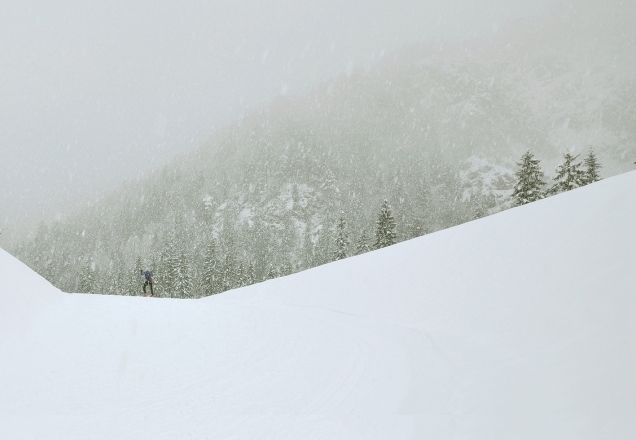 Consequently, interventions in mountain ambients must be informed by long-term thinking; subordinate to the exceptional Alpine scenery in their form and materiality; respectful of the cultural context; and quantitatively restricted. 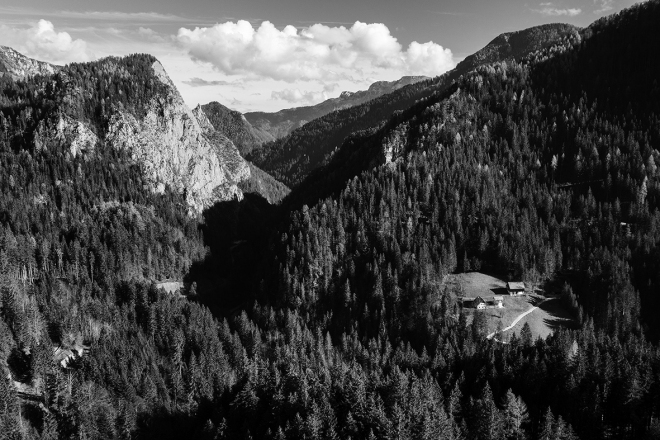 In the 1990s, the states which are territorially affiliated by the Alpine space, conscious of the fragility of the Alpine context, acceded to the Convention on the Protection of the Alps, an international treaty whose central purpose is to ensure comprehensive protection and sustainable development of the Alpine world and simultaneously protect the economic and cultural interests of the inhabitants including the preservation of regional identities and cultural specifics, typical settlement designs, and the preservation and re-establishment of typical built heritage. 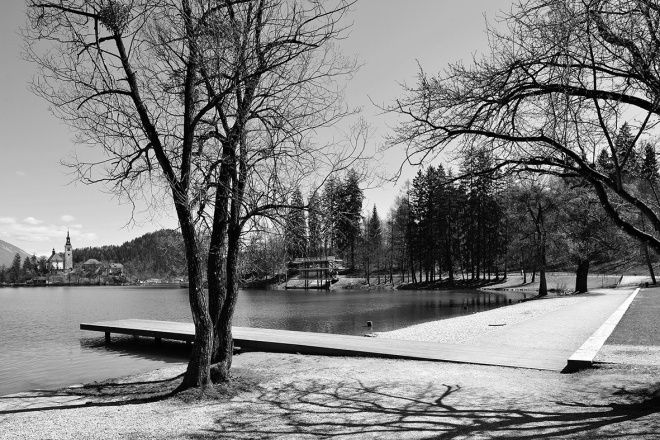 The area covered by the Alpine Convention constitutes 33.4% of the territory of Slovenia, includes 62 municipalities, represents the living environment for 365.000 inhabitants; however, there is a wider importance attached to this space as people seek in it employment opportunities, and furthermore pursue leisure, relaxation, and recreation. 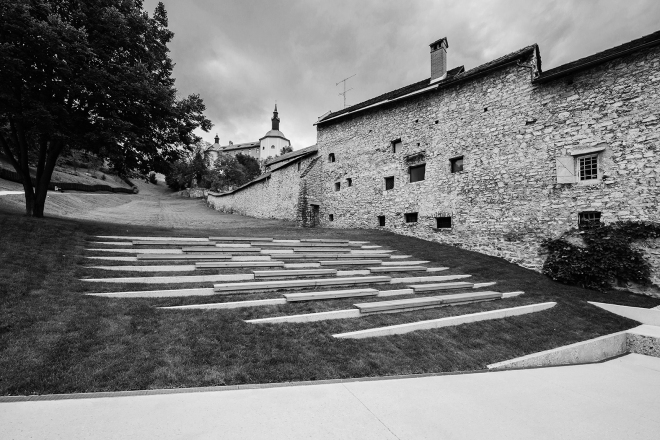 Exhibition Slovene Alpine Architecture 2008–2018 showcases 30 finest achievements and greatest standouts in Slovene Alpine architectural production of the last ten years in the Alpine region as defined by the Alpine Convention. 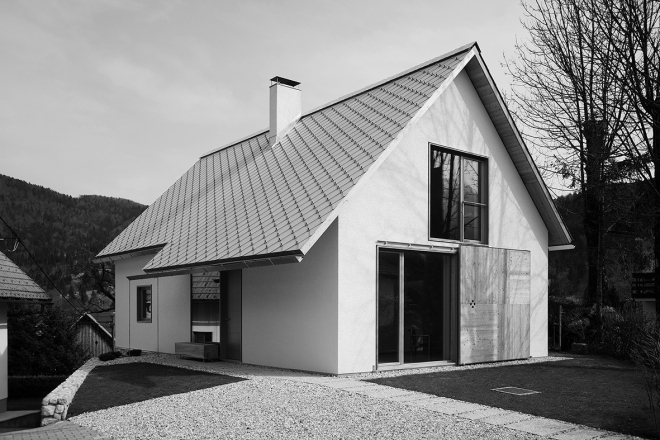 From the works nominated by curators Kristina Dešman, Maja Ivanič, and Špela Nardoni Kovač, international selector, Austrian architect Bernardo Bader chose the 22 top-ranked. 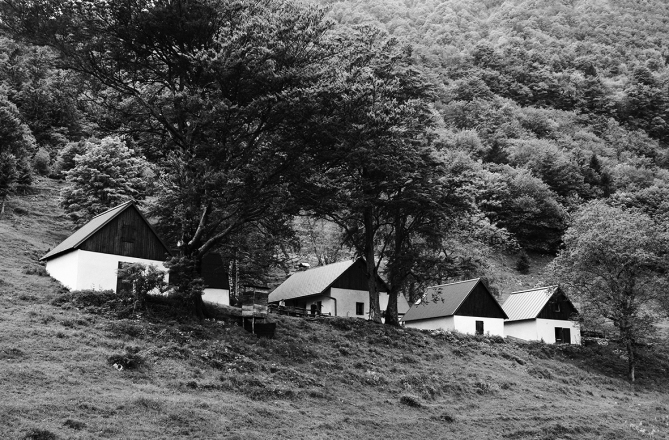 In the process of collecting the material, we realised that the Slovene Alpine region is brimming with activity – not only in terms of construction, but first and foremost in terms of tourism development, which greatly affects construction activities and therefore also the appearance of the landscape and its natural and cultural identity. 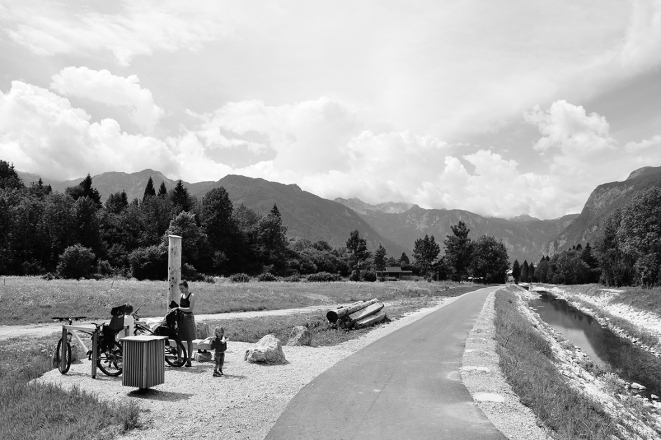 The threshold beyond which tourism turns into cultural and spatial pollution is very low. 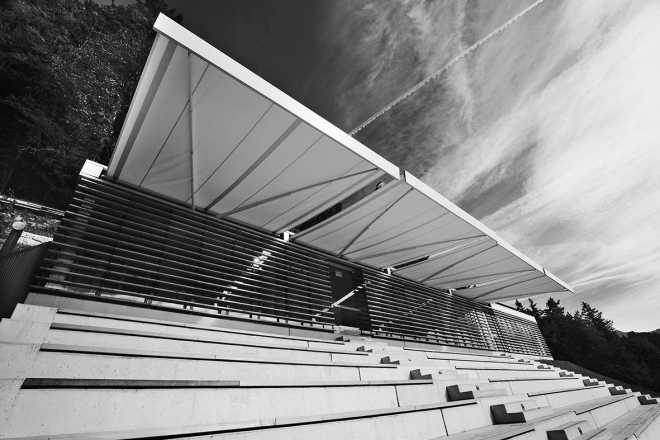 In the exhibition as well as in the ab magazine, the projects are organised according to the programme – open space, sports facilities, bivouacs and tourism facilities, public buildings, dwelling and leisure –, while their place in the order of presentation is dictated by the year of their realisation. 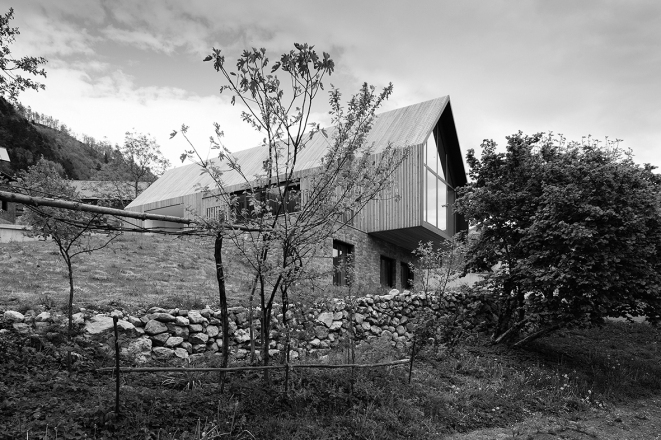 The chosen projects are distinguished by the understanding of and respect for the natural and cultural landscape, the outline with their size and form carefully embedded in the scenery of mountain ambients, contemporary and competent spatial designs, the choice of sustainable materials, the interpretation of traditional built heritage with contemporary methods, and not least the preservation of local tradition and the knowledge and insights of our ancestors. Individual residential and tourist architectures are the most numerous. Beside the qualities listed above, the otherwise anonymous architecture is characterized by superior quality of habitation and considered detail throughout, including the interior furnishing. 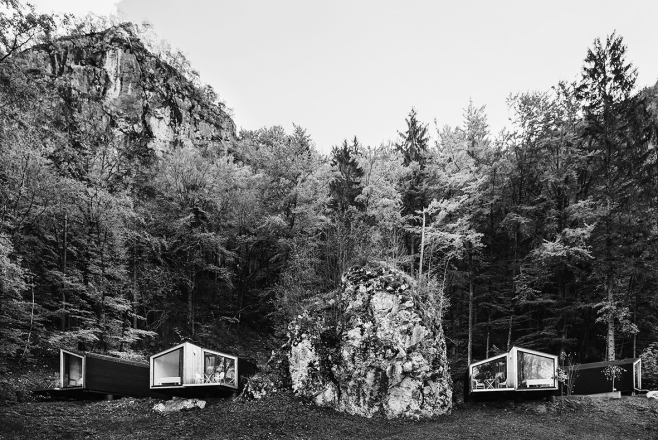 Bivouacs are important milestones of contemporary Slovene architecture and technology. 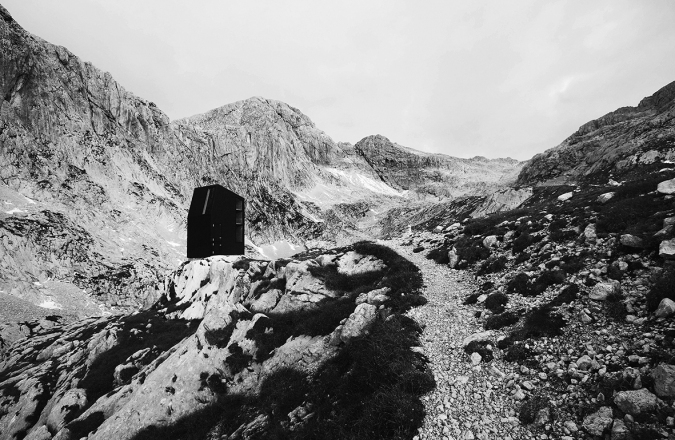 The primeval element of shelter at all times defying the harsh mountain conditions transcends its primary function and delivers to the mountaineer impressive views and an experience of the surrounding space. 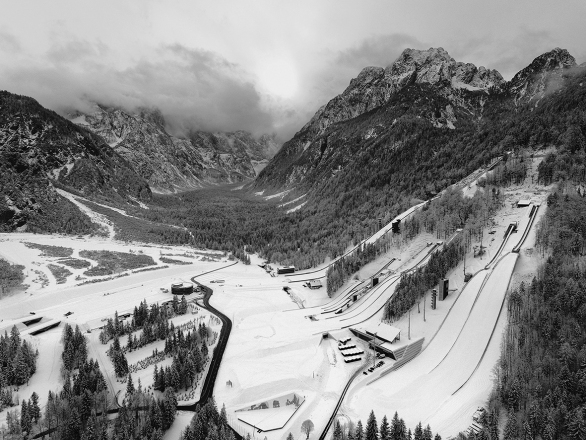 Planica with its ski-jumping infrastructure and Bled with the rowing centre are important points on the world sports map. 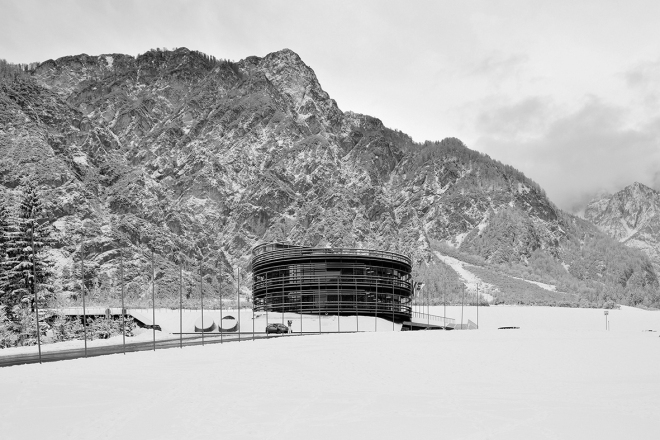 With the exterior layouts, the architecture does not only reach beyond the Slovene norm but places the two centres squarely with other successfully spatially regulated sports facility complexes worldwide. Both projects combine thoughtful architecture with exterior and landscape layouts which they subtly and respectfully intertwine with the existing natural and spatial properties and contemporary expression. With their quality interior layout and appearance in the space, the chosen business programme and public infrastructure projects enhance the public space of the settlements and centres and at the same time reflect the character of the place in which they are sited. 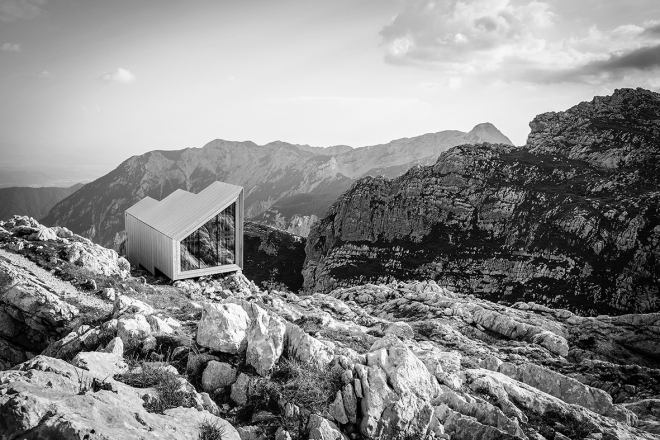 The review of contemporary Alpine architecture in Slovenia reveals an important quality. 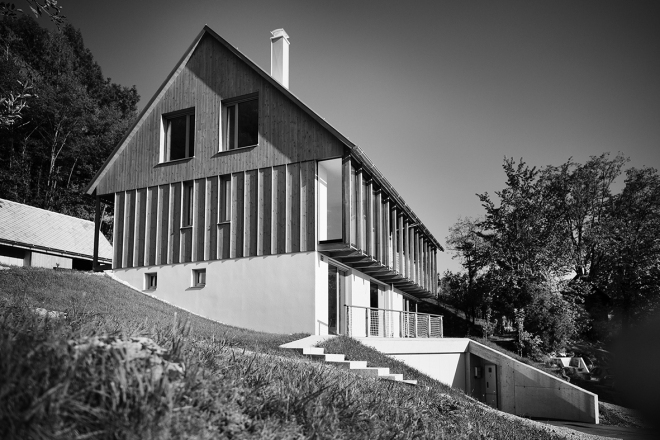 To quote selector architect Bernardo Bader, the chosen Slovene architecture is impressive and innovative. 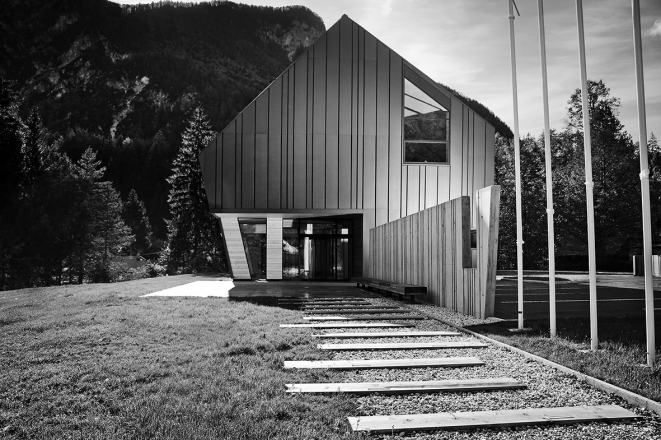 It serves as a model regarding the treatment of the environment and use of materials, and it has great influence on the development of architecture and programme strategies in the entire Alpine region. 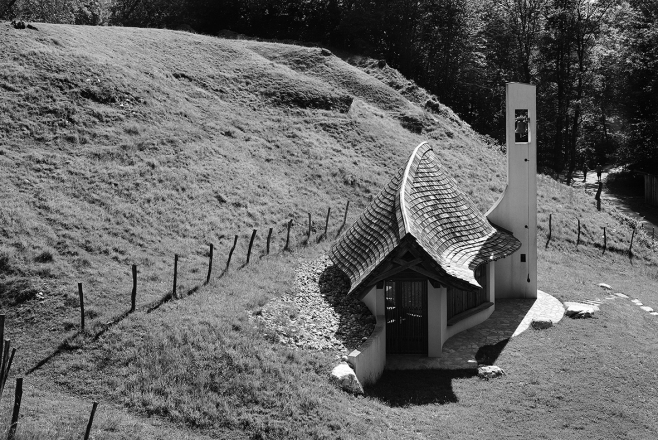 We must keep in mind, however, that the image of Slovene architecture as showcased in the exhibition does quite not paint a complete picture. The exhibited standout projects and their remarkable quality does not accurately reflect the situation in the field. We are sad to witness the decay of many wonderfully made and adeptly sited traditional buildings which are being replaced by anonymous, not even generic architectures, sometimes featuring loud, brightly-coloured facades. 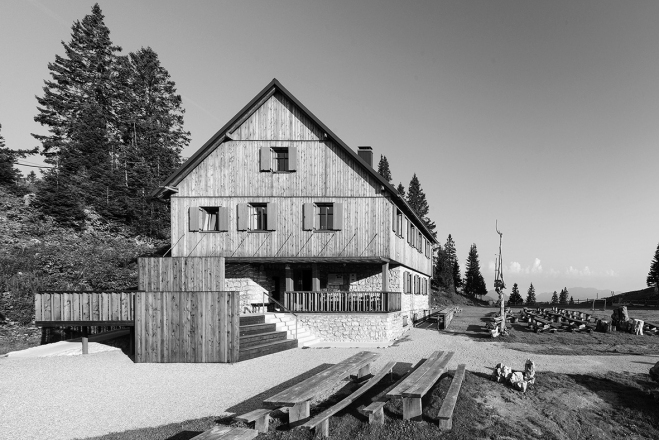 The centres of Alpine towns and villages still call for planned regulation and spatial concentration through quality architecture which would ensure their identity and a gravitational point. More attention should definitely be paid to dilapidated or even non-existent infrastructure. 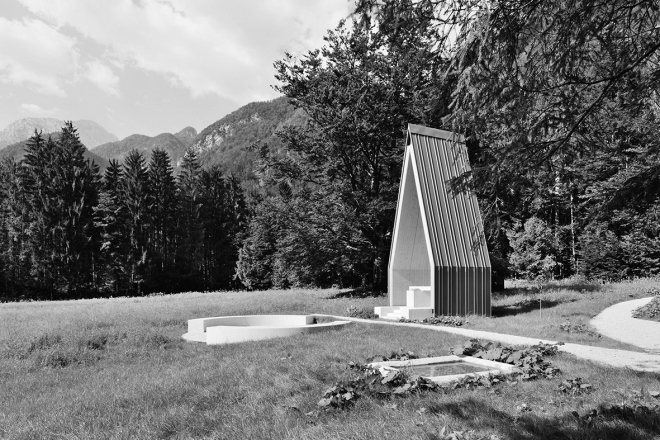 All of this emphasises the need for thematic exhibitions and discussions to serve as a conduit for establishing the standards and models for further considerations on the Slovene Alpine space, both in general and from the standpoint of the built environment: the exhibition which, after its initial showing in Galerija Dessa, will hopefully travel around Slovenia and abroad, and the accompanying issue of Architects' Bulletin magazine, which complements the catalogue of the exhibited projects with critical texts and historical perspective. 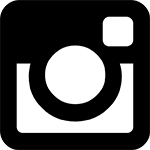 Architecture is the key bearer of the identity of an individual space, which enhances the natural environment. 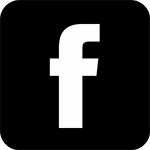 At the same time, it is a tool for preserving the authenticity of a space, its attractiveness in terms of habitation and tourism, and the driver of economic value. We want the showcased examples of quality architecture to act as models and a positive encouragement for future public and private builders. 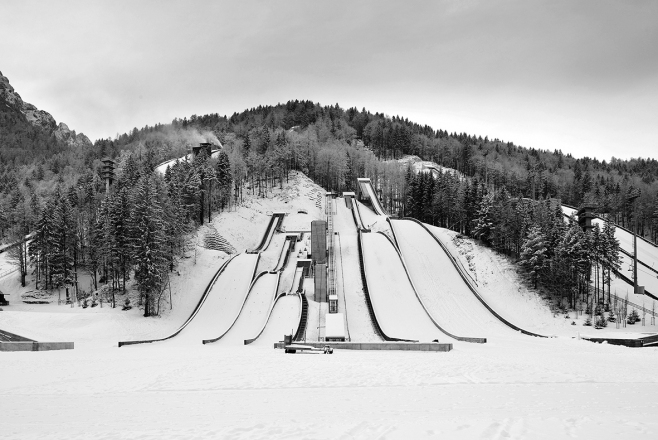 Let us preserve the Slovene Alpine fragility. 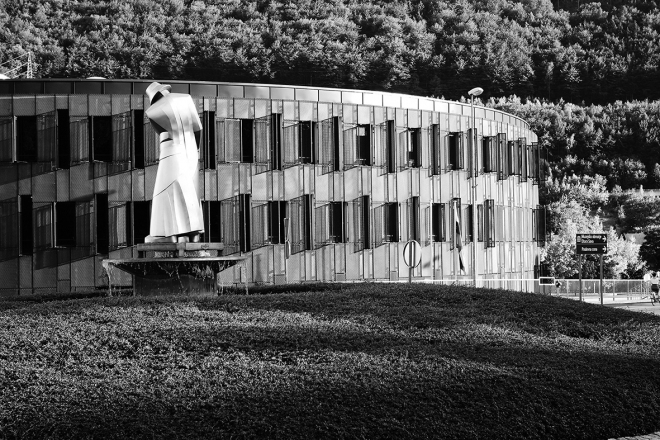 For the nth time, the exhibition puts on display remarkable realised buildings in Slovenia. 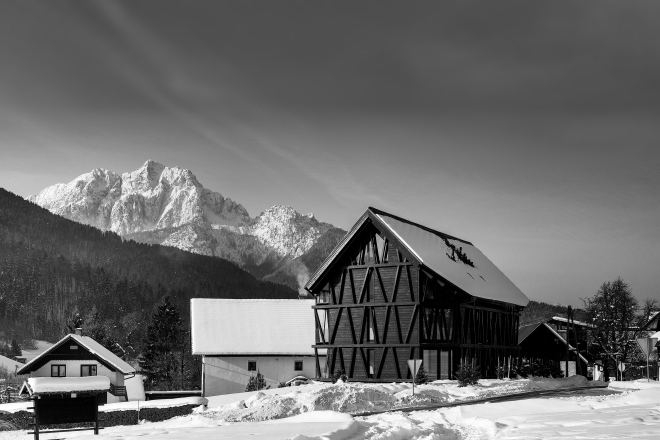 Building in the Alps encompasses classic buildings for tourism and alpine sports, infrastructure (including shelters), and (holiday) homes. 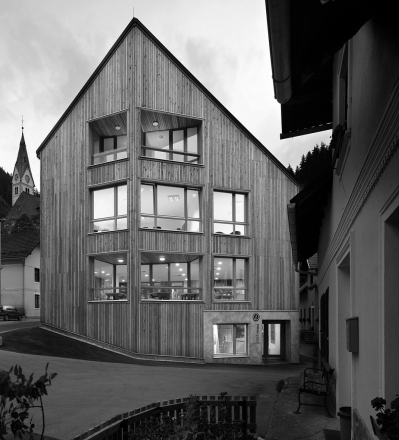 The positive influence of quality architecture built in the centres of small villages is both notable and precious. 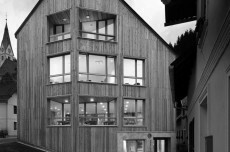 Good architecture creates contemporary identity, as do quality office buildings providing jobs far away from the city and thus sustaining the vitality in the Alps. In addition to new buildings, the revitalization of historic buildings must be brought to attention as tradition in plain sight, newly inhabited and appreciated by both the locals and guests. More than mere landscape planning is to be found in the Open Space category: vital infrastructure which is to exist for many decades, being not only practical and valuable for the whole population but also restrained and beautiful within the landscape, serving its purpose day in day out. 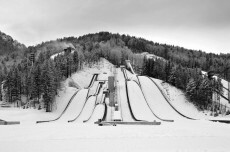 In the Sports Facilities category, movement – ski jumping and rowing – is elegantly transformed into architecture and sited in the existing terrain. 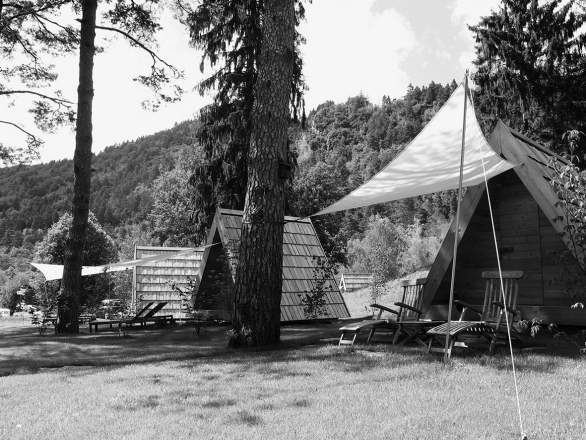 The Bivouacs and Tourism Facilities category mainly showcases protective structures. 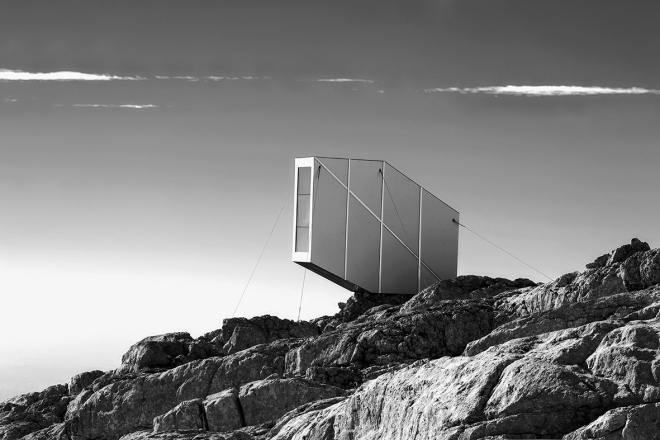 Buildings, strong, resistant to the elements and technically sophisticated, usually occupy solitary spots in the indomitable nature. Public Buildings show community centres, museums, prayer rooms, and office buildings. 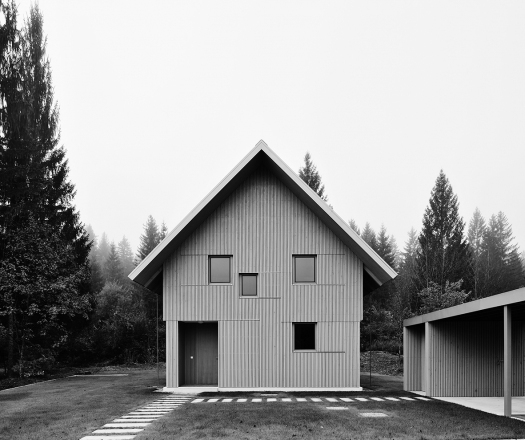 Striking, identity-forming buildings act as a spot to gather around and create added value. The Houses: Dwelling and Leisure category shows (holiday) homes, which have often been developed from existing buildings. They uniquely convey the value of staying in a certain place to their residents. Both the locals and guests enjoy the sense of well-being communicated by their environment. 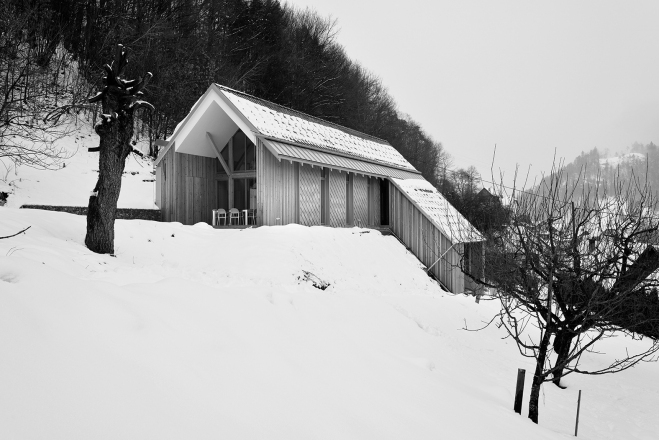 Though we find ourselves in the Alps, the building materials are not limited to timber but combine with concrete, metal, glass, and stone. 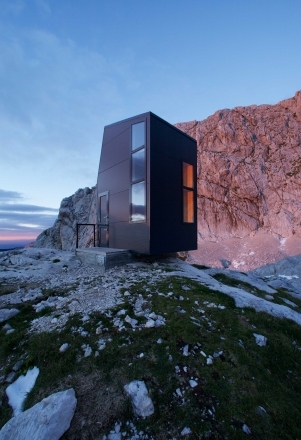 The architecture in the Slovene Alps is impressive and innovative. 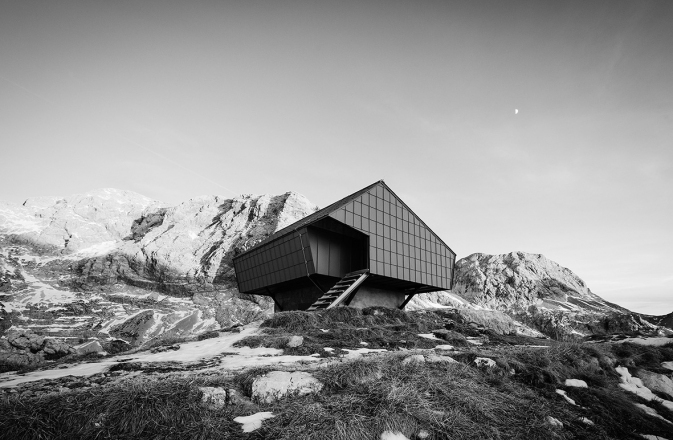 The exhibition presents new architecture in Slovenia, which is exemplary in its establishing a relationship with the environment, its choice of material, and its impact on the future development of architecture in the entire Alpine region.